These highlights do not include all the information needed to use EMEND FOR INJECTION safely and effectively. See full prescribing information for EMEND FOR INJECTION. acute and delayed nausea and vomiting associated with initial and repeat courses of highly emetogenic cancer chemotherapy (HEC) including high-dose cisplatin. delayed nausea and vomiting associated with initial and repeat courses of moderately emetogenic cancer chemotherapy (MEC). 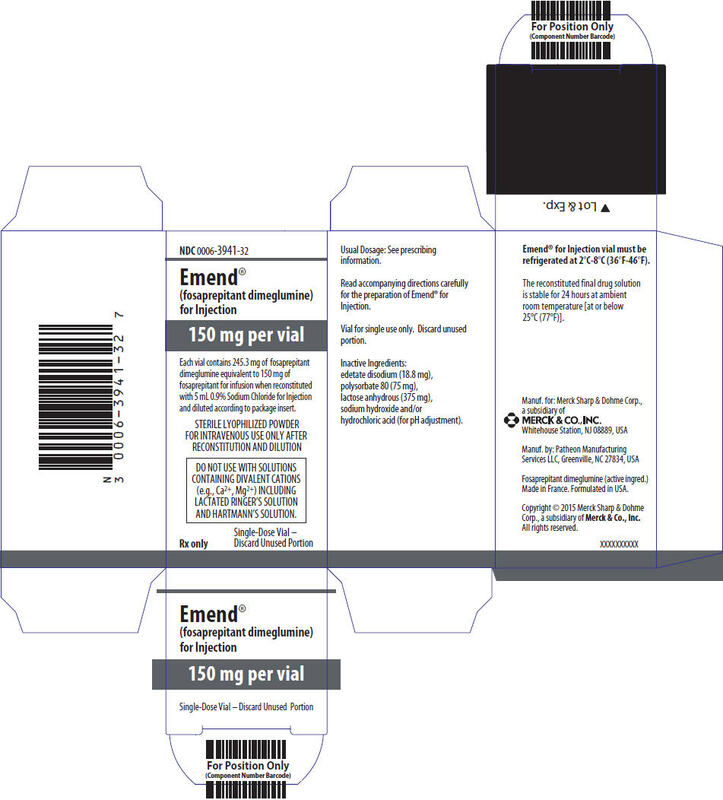 EMEND has not been studied for treatment of established nausea and vomiting. Recommended dosage in adults is 150 mg on Day 1 as an intravenous infusion over 20 to 30 minutes approximately 30 minutes prior to chemotherapy. See Full Prescribing Information for recommended dosages of concomitant dexamethasone and a 5-HT3 antagonist for HEC and MEC. Reconstitute with 5 mL of 0.9% sodium chloride. Add to infusion bag containing 145 mL 0.9% sodium chloride for a final concentration of 1 mg/mL. 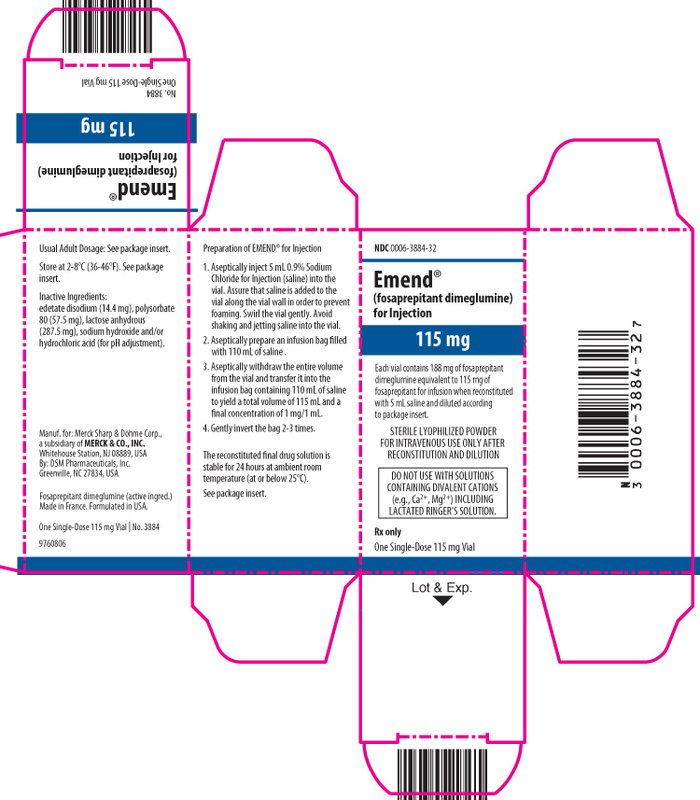 EMEND has not been studied for the treatment of established nausea and vomiting. The recommended dosage of EMEND for injection, dexamethasone, and a 5-HT3 antagonist in adults for the prevention of nausea and vomiting associated with administration of HEC or MEC is shown in Table 1 or Table 2, respectively. Administer EMEND for injection as an intravenous infusion on Day 1 over 20 to 30 minutes approximately 30 minutes prior to chemotherapy. Administer dexamethasone 30 minutes prior to chemotherapy treatment on Day 1 and in the morning on Days 2 through 4. Also administer dexamethasone in the evenings on Days 3 and 4. A 50% dosage reduction of dexamethasone on Days 1 and 2 is recommended to account for a drug interaction with EMEND [see Clinical Pharmacology (12.3)]. Administer dexamethasone 30 minutes prior to chemotherapy treatment on Day 1. A 50% dosage reduction of dexamethasone is recommended to account for a drug interaction with EMEND [see Clinical Pharmacology (12.3)]. Step 1 Aseptically inject 5 mL 0.9% Sodium Chloride Injection, USP into the vial. Assure that 0.9% Sodium Chloride Injection, USP is added to the vial along the vial wall in order to prevent foaming. Swirl the vial gently. Avoid shaking and jetting 0.9% Sodium Chloride Injection, USP into the vial. Step 2 Aseptically prepare an infusion bag filled with 145 mL of 0.9% Sodium Chloride Injection, USP. Step 3 Aseptically withdraw the entire volume from the vial and transfer it into the infusion bag containing 145 mL of 0.9% Sodium Chloride Injection, USP to yield a total volume of 150 mL and a final concentration of 1 mg/mL. Step 4 Gently invert the bag 2 to 3 times. Step 5 Before administration, inspect the bag for particulate matter and discoloration. Discard the bag if particulate and/or discoloration are observed. Caution: Do not mix or reconstitute EMEND for injection with solutions for which physical and chemical compatibility have not been established. EMEND for injection is incompatible with any solutions containing divalent cations (e.g., Ca2+, Mg2+), including Lactated Ringer's Solution and Hartmann's Solution. The reconstituted final drug solution is stable for 24 hours at ambient room temperature [at or below 25°C (77°F)]. who are hypersensitive to any component of the product. Hypersensitivity reactions including anaphylactic reactions, flushing, erythema, and dyspnea have been reported [see Warnings and Precautions (5.2), Adverse Reactions (6.2)]. taking pimozide. Inhibition of CYP3A4 by aprepitant, the active moiety, could result in elevated plasma concentrations of this drug, which is a CYP3A4 substrate, potentially causing serious or life-threatening reactions, such as QT prolongation, a known adverse reaction of pimozide [see Warnings and Precautions (5.1)]. Fosaprepitant, a prodrug of aprepitant, is a weak inhibitor of CYP3A4, and aprepitant is a substrate, inhibitor, and inducer of CYP3A4. Use of EMEND with other drugs that are CYP3A4 substrates, may result in increased plasma concentration of the concomitant drug. Use of pimozide with EMEND is contraindicated due to the risk of significantly increased plasma concentrations of pimozide, potentially resulting in prolongation of the QT interval, a known adverse reaction of pimozide [see Contraindications (4)]. Use of EMEND with strong or moderate CYP3A4 inhibitors (e.g., ketoconazole, diltiazem) may increase plasma concentrations of aprepitant and result in an increased risk of adverse reactions related to EMEND. Use of EMEND with strong CYP3A4 inducers (e.g., rifampin) may result in a reduction in aprepitant plasma concentrations and decreased efficacy of EMEND. See Table 5 and Table 6 for a listing of potentially significant drug interactions [see Drug Interactions (7.1, 7.2)]. Serious hypersensitivity reactions, including anaphylaxis and anaphylactic shock, during or soon after infusion of fosaprepitant have occurred. Symptoms including flushing, erythema, dyspnea, hypotension and syncope have been reported [see Adverse Reactions (6.2)]. Monitor patients during and after infusion. If hypersensitivity reactions occur, discontinue the infusion and administer appropriate medical therapy. Do not reinitiate EMEND in patients who experience these symptoms with first-time use [see Contraindications (4)]. Infusion site reactions (ISRs) have been reported with the use of EMEND for injection [see Adverse Reactions (6.1)]. The majority of severe ISRs, including thrombophlebitis and vasculitis, were reported with concomitant vesicant (anthracycline-based) chemotherapy administration, particularly when associated with extravasation. Necrosis was also reported in some patients with concomitant vesicant chemotherapy. Most ISRs occurred with the first, second or third exposure to single doses of EMEND for injection and in some cases, reactions persisted for two weeks or longer. Treatment of severe ISRs consisted of medical, and in some cases surgical, intervention. Avoid infusion of EMEND for injection into small veins or through a butterfly catheter. If a severe ISR develops during infusion, discontinue the infusion and administer appropriate medical treatment. Coadministration of EMEND with warfarin, a CYP2C9 substrate, may result in a clinically significant decrease in the International Normalized Ratio (INR) of prothrombin time [see Clinical Pharmacology (12.3)]. Monitor the INR in patients on chronic warfarin therapy in the 2-week period, particularly at 7 to 10 days, following initiation of EMEND with each chemotherapy cycle [see Drug Interactions (7.1)]. Upon coadministration with EMEND, the efficacy of hormonal contraceptives may be reduced during administration of and for 28 days following the last dose of EMEND [see Clinical Pharmacology (12.3)]. Advise patients to use effective alternative or back-up methods of contraception during treatment with EMEND and for 1 month following administration of EMEND [see Drug Interactions (7.1), Use in Specific Populations (8.3)]. The overall safety of EMEND for injection was evaluated in approximately 1600 individuals. In an active-controlled clinical trial in patients receiving MEC, safety was evaluated in 504 patients receiving a single dose of EMEND for injection in combination with ondansetron and dexamethasone (EMEND regimen) compared to 497 patients receiving ondansetron and dexamethasone alone (standard therapy). The most common adverse reactions are listed in Table 4. Reported in ≥ 2% of patients treated with the EMEND regimen and at a greater incidence than standard therapy. Infusion-site reactions were reported in 2.2% of patients treated with the EMEND regimen compared to 0.6% of patients treated with standard therapy. The infusion-site reactions included: infusion-site pain (1.2%, 0.4%), injection-site irritation (0.2%, 0.0%), vessel puncture-site pain (0.2%, 0.0%), and infusion-site thrombophlebitis (0.6%, 0.0%), reported in the EMEND regimen compared to standard therapy, respectively. In an active-controlled clinical study in patients receiving HEC, safety was evaluated for 1143 patients receiving a single dose of EMEND for injection compared to 1169 patients receiving the 3-day regimen of oral EMEND (aprepitant) [see Clinical Studies (14.1)]. The safety profile was generally similar to that seen in the MEC study with fosaprepitant and prior HEC studies with aprepitant. However, infusion-site reactions occurred at a higher incidence in patients in the fosaprepitant group (3.0%) compared to those in the aprepitant group (0.5%). The following additional infusion-site reactions occurred in the HEC study and were not reported in the MEC study described above: infusion-site erythema (0.5%, 0.1%), infusion-site pruritus (0.3%, 0.0%), and infusion-site induration (0.2%, 0.1%), reported in the fosaprepitant group compared to the aprepitant group, respectively. Since fosaprepitant is converted to aprepitant, those adverse reactions associated with aprepitant might also be expected to occur with EMEND for injection. See the full prescribing information for EMEND capsules for complete safety information regarding studies performed with oral aprepitant. The following adverse reactions have been identified during post-approval use of EMEND. Because these reactions are reported voluntarily from a population of uncertain size, it is not always possible to reliably estimate their frequency or establish a causal relationship to drug exposure. Skin and subcutaneous tissue disorders: pruritus, rash, urticaria, Stevens-Johnson syndrome/toxic epidermal necrolysis [see Warnings and Precautions (5.2)]. Immune system disorders: hypersensitivity reactions including anaphylaxis and anaphylactic shock [see Contraindications (4), Warnings and Precautions (5.2)]. Nervous system disorders: ifosfamide-induced neurotoxicity reported after EMEND and ifosfamide coadministration. When administered intravenously, fosaprepitant, a prodrug of aprepitant, is converted to aprepitant within 30 minutes. Therefore, drug interactions following administration of EMEND for injection are likely to occur with drugs that interact with oral aprepitant. Fosaprepitant, given as a single 150-mg dose, is a weak inhibitor of CYP3A4, and the weak inhibition of CYP3A4 continues for 2 days after single dose administration. Single dose fosaprepitant does not induce CYP3A4. Aprepitant is a substrate, an inhibitor, and an inducer of CYP3A4. Aprepitant is also an inducer of CYP2C9 [see Clinical Pharmacology (12.3)]. Some substrates of CYP3A4 are contraindicated with EMEND [see Contraindications (4)]. Dosage adjustment of some CYP3A4 and CYP2C9 substrates may be warranted, as shown in Table 5. Intervention EMEND is contraindicated [see Contraindications (4)]. Clinical Impact Increased exposure to midazolam or other benzodiazepines metabolized via CYP3A4 (alprazolam, triazolam) may increase the risk of adverse reactions [see Clinical Pharmacology (12.3)]. Intervention Monitor for benzodiazepine-related adverse reactions. Clinical Impact Increased dexamethasone exposure [see Clinical Pharmacology (12.3)]. Intervention Reduce the dose of oral dexamethasone by approximately 50% [see Dosage and Administration (2.1)]. Clinical Impact Increased methylprednisolone exposure [see Clinical Pharmacology (12.3)]. Intervention Reduce the dose of oral methylprednisolone by approximately 50% on Days 1 and 2 for patients receiving HEC and on Day 1 for patients receiving MEC. Reduce the dose of intravenous methylprednisolone by 25% on Days 1 and 2 for patients receiving HEC and on Day 1 for patients receiving MEC. Clinical Impact Increased exposure of the chemotherapeutic agent may increase the risk of adverse reactions [see Clinical Pharmacology (12.3)]. Monitor for chemotherapeutic-related adverse reactions. Clinical Impact Decreased hormonal exposure during administration of and for 28 days after administration of the last dose of EMEND [see Warnings and Precautions (5.5), Use in Specific Populations (8.3), and Clinical Pharmacology (12.3)]. Intervention Effective alternative or back-up methods of contraception (such as condoms and spermicides) should be used during treatment with EMEND and for 1 month following administration of EMEND. Clinical Impact Decreased warfarin exposure and prolongation of prothrombin time (INR) [see Warnings and Precautions (5.4), Clinical Pharmacology (12.3)]. Intervention In patients on chronic warfarin therapy, monitor the prothrombin time (INR) in the 2-week period, particularly at 7 to 10 days, following administration of EMEND with each chemotherapy cycle. Clinical Impact No change in the exposure of the 5-HT3 antagonist [see Clinical Pharmacology (12.3)]. Aprepitant is a CYP3A4 substrate [see Clinical Pharmacology (12.3)]. Co-administration of EMEND with drugs that are inhibitors or inducers of CYP3A4 may result in increased or decreased plasma concentrations of aprepitant, respectively, as shown in Table 6. Clinical Impact Significantly increased exposure of aprepitant may increase the risk of adverse reactions associated with EMEND [see Adverse Reactions (6.1), Clinical Pharmacology (12.3)]. Clinical Impact Substantially decreased exposure of aprepitant in patients chronically taking a strong CYP3A4 inducer may decrease the efficacy of EMEND [see Clinical Pharmacology (12.3)]. There are insufficient data on use of EMEND in pregnant women to inform a drug associated risk. In animal reproduction studies, no adverse developmental effects were observed in rats or rabbits exposed during the period of organogenesis to systemic drug levels (AUC) approximately equivalent to the exposure at the recommended human dose (RHD) of 150 mg [see Data]. The estimated background risk of major birth defects and miscarriage for the indicated populations is unknown. In the U.S. general population, the estimated background risk of major birth defects and miscarriage in clinically recognized pregnancies is 2 to 4% and 15 to 20%, respectively. In embryofetal development studies in rats and rabbits, aprepitant was administered during the period of organogenesis at oral doses up to 1000 mg/kg twice daily (rats) and up to the maximum tolerated dose of 25 mg/kg/day (rabbits). No embryofetal lethality or malformations were observed at any dose level in either species. The exposures (AUC) in pregnant rats at 1000 mg/kg twice daily and in pregnant rabbits at 125 mg/kg/day were approximately equivalent to the exposure at the RHD of 150 mg. Aprepitant crosses the placenta in rats and rabbits. Lactation studies have not been conducted to assess the presence of aprepitant in human milk, the effects on the breastfed infant, or the effects on milk production. Aprepitant is present in rat milk. The developmental and health benefits of breastfeeding should be considered along with the mother's clinical need for EMEND and any potential adverse effects on the breastfed infant from EMEND or from the underlying maternal condition. Upon administration of EMEND, the efficacy of hormonal contraceptives may be reduced. Advise females of reproductive potential using hormonal contraceptives to use an effective alternative or back-up non-hormonal contraceptive (such as condoms and spermicides) during treatment with EMEND and for 1 month following the last dose [see Drug Interactions (7.1), Clinical Pharmacology (12.3)]. The safety and effectiveness of EMEND for injection have not been established in pediatric patients. Of the 1649 adult cancer patients treated with intravenous EMEND in HEC and MEC clinical studies, 27% were aged 65 and over, while 5% were aged 75 and over. Other reported clinical experience with EMEND has not identified differences in responses between elderly and younger patients. In general, use caution when dosing elderly patients as they have a greater frequency of decreased hepatic, renal or cardiac function and concomitant disease or other drug therapy [see Clinical Pharmacology (12.3)]. The pharmacokinetics of aprepitant in patients with mild and moderate hepatic impairment were similar to those of healthy subjects with normal hepatic function. No dosage adjustment is necessary for patients with mild to moderate hepatic impairment (Child-Pugh score 5 to 9). There are no clinical or pharmacokinetic data in patients with severe hepatic impairment (Child-Pugh score greater than 9). Therefore, additional monitoring for adverse reactions in these patients may be warranted when EMEND is administered [see Clinical Pharmacology (12.3)]. There is no specific information on the treatment of overdosage with fosaprepitant or aprepitant. In the event of overdose, EMEND should be discontinued and general supportive treatment and monitoring should be provided. Because of the antiemetic activity of EMEND, drug-induced emesis may not be effective in cases of EMEND overdosage. Aprepitant is not removed by hemodialysis. EMEND (fosaprepitant) for injection is a sterile, lyophilized formulation containing fosaprepitant dimeglumine, a prodrug of aprepitant, a substance P/neurokinin-1 (NK1) receptor antagonist, an antiemetic agent, chemically described as 1-Deoxy-1-(methylamino)-D-glucitol[3-[[(2R,3S)-2-[(1R)-1-[3,5-bis(trifluoromethyl)phenyl]ethoxy]-3-(4-fluorophenyl)-4-morpholinyl]methyl]-2,5-dihydro-5-oxo-1H-1,2,4-triazol-1-yl]phosphonate (2:1) (salt). Fosaprepitant dimeglumine is a white to off-white amorphous powder with a molecular weight of 1004.83. It is freely soluble in water. Each vial of EMEND for injection for administration as an intravenous infusion contains 150 mg of fosaprepitant (equivalent to 245.3 mg of fosaprepitant dimeglumine) and the following inactive ingredients: edetate disodium (18.8 mg), polysorbate 80 (75 mg), lactose anhydrous (375 mg), sodium hydroxide and/or hydrochloric acid (for pH adjustment). Aprepitant is a selective high-affinity antagonist of human substance P/neurokinin 1 (NK1) receptors. Aprepitant has little or no affinity for serotonin (5-HT3), dopamine, and corticosteroid receptors, the targets of existing therapies for chemotherapy-induced nausea and vomiting (CINV). Aprepitant has been shown in animal models to inhibit emesis induced by cytotoxic chemotherapeutic agents, such as cisplatin, via central actions. Animal and human Positron Emission Tomography (PET) studies with aprepitant have shown that it crosses the blood brain barrier and occupies brain NK1 receptors. Animal and human studies show that aprepitant augments the antiemetic activity of the 5-HT3-receptor antagonist ondansetron and the corticosteroid dexamethasone and inhibits both the acute and delayed phases of cisplatin-induced emesis. In a randomized, double-blind, positive-controlled, thorough QTc study, a single 200-mg dose of fosaprepitant (approximately 1.3 times the recommended dose) had no effect on the QTc interval. Following administration of a single intravenous 150-mg dose of fosaprepitant, a prodrug of aprepitant administered as a 20-minute infusion to healthy subjects, the mean AUC0-∞ of aprepitant was 37.4 (± 14.8) mcg∙hr/mL and the mean maximal aprepitant concentration (Cmax) was 4.2 (± 1.2) mcg/mL. Plasma concentrations of fosaprepitant are below the limits of quantification (10 ng/mL) within 30 minutes of the completion of infusion. Aprepitant is greater than 95% bound to plasma proteins. The mean apparent volume of distribution at steady state (Vdss) was approximately 70 L in humans. Aprepitant crosses the blood brain barrier in humans [see Clinical Pharmacology (12.1)]. Fosaprepitant is converted to aprepitant in in vitro incubations with human liver preparations and in S9 preparations from multiple other human tissues including kidney, lung and ileum. Thus, it appears that the conversion of fosaprepitant to aprepitant can occur in multiple extrahepatic tissues in addition to the liver. Aprepitant undergoes extensive metabolism. In vitro studies using human liver microsomes indicate that aprepitant is metabolized primarily by CYP3A4 with minor metabolism by CYP1A2 and CYP2C19. Metabolism is largely via oxidation at the morpholine ring and its side chains. No metabolism by CYP2D6, CYP2C9, or CYP2E1 was detected. In healthy young adults, aprepitant accounts for approximately 24% of the radioactivity in plasma over 72 hours following a single oral 300-mg dose of [14C]-aprepitant, indicating a substantial presence of metabolites in the plasma. Seven metabolites of aprepitant, which are only weakly active, have been identified in human plasma. Following administration of a single intravenous 100-mg dose of [14C]-fosaprepitant to healthy subjects, 57% of the radioactivity was recovered in urine and 45% in feces. Following oral administration of a single 125-mg dose of aprepitant on Day 1 and 80 mg once daily on Days 2 through 5, the AUC0-24hr of aprepitant was 21% higher on Day 1 and 36% higher on Day 5 in elderly (65 years and older) relative to younger adults. The Cmax was 10% higher on Day 1 and 24% higher on Day 5 in elderly relative to younger adults. These differences are not considered clinically meaningful [see Use in Specific Populations (8.5)]. Following oral administration of a single dose of aprepitant, ranging from 40 mg to 375 mg, the AUC0-24hr and Cmax are 9% and 17% higher in females as compared with males. The half-life of aprepitant is approximately 25% lower in females as compared with males and Tmax occurs at approximately the same time. These differences are not considered clinically meaningful. Following oral administration of a single dose of aprepitant, ranging from 40 mg to 375 mg, the AUC0-24hr and Cmax are approximately 27% and 19% higher in Hispanics as compared with Caucasians. The AUC0-24hr and Cmax were 74% and 47% higher in Asians as compared to Caucasians. There was no difference in AUC0-24hr or Cmax between Caucasians and Blacks. These differences are not considered clinically meaningful. A single 240-mg oral dose of aprepitant was administered to patients with severe renal impairment (creatinine clearance less than 30 mL/min/1.73 m2 as measured by 24-hour urinary creatinine clearance) and to patients with end stage renal disease (ESRD) requiring hemodialysis. In patients with severe renal impairment, the AUC0-∞ of total aprepitant (unbound and protein bound) decreased by 21% and Cmax decreased by 32%, relative to healthy subjects (creatinine clearance greater than 80 mL/min estimated by Cockcroft-Gault method). In patients with ESRD undergoing hemodialysis, the AUC0-∞ of total aprepitant decreased by 42% and Cmax decreased by 32%. Due to modest decreases in protein binding of aprepitant in patients with renal disease, the AUC of pharmacologically active unbound drug was not significantly affected in patients with renal impairment compared with healthy subjects. Hemodialysis conducted 4 or 48 hours after dosing had no significant effect on the pharmacokinetics of aprepitant; less than 0.2% of the dose was recovered in the dialysate. Following administration of a single 125-mg oral dose of aprepitant on Day 1 and 80 mg once daily on Days 2 and 3 to patients with mild hepatic impairment (Child-Pugh score 5 to 6), the AUC0-24hr of aprepitant was 11% lower on Day 1 and 36% lower on Day 3, as compared with healthy subjects given the same regimen. In patients with moderate hepatic impairment (Child-Pugh score 7 to 9), the AUC0-24hr of aprepitant was 10% higher on Day 1 and 18% higher on Day 3, as compared with healthy subjects given the same regimen. These differences in AUC0-24hr are not considered clinically meaningful. There are no clinical or pharmacokinetic data in patients with severe hepatic impairment (Child-Pugh score greater than 9) [see Use in Specific Populations (8.6)]. For every 5 kg/m2 increase in BMI, AUC0-24hr and Cmax of aprepitant decrease by 9% and 10%. BMI of subjects in the analysis ranged from 18 kg/m2 to 36 kg/m2. This change is not considered clinically meaningful. Fosaprepitant, given as a single 150-mg dose, is a weak inhibitor of CYP3A4, with no evidence of inhibition or induction of CYP3A4 observed on Day 4. The weak inhibition of CYP3A4 continues for 2 days after single dose administration of fosaprepitant. Aprepitant is a substrate, an inhibitor, and an inducer of CYP3A4. Aprepitant is also an inducer of CYP2C9. Fosaprepitant or aprepitant is unlikely to interact with drugs that are substrates for the P-glycoprotein transporter. Midazolam: Fosaprepitant 150 mg administered as a single intravenous dose on Day 1 increased the AUC0-∞ of midazolam by approximately 1.8-fold on Day 1 and had no effect on Day 4 when midazolam was coadministered as a single oral dose of 2 mg on Days 1 and 4 [see Drug Interactions (7.1)]. Dexamethasone: Fosaprepitant administered as a single 150 mg intravenous dose on Day 1 increased the AUC0-24hr of dexamethasone, administered as a single 8-mg oral dose on Days 1, 2, and 3, by approximately 2-fold on Days 1 and 2 [see Dosage and Administration (2.1), Drug Interactions (7.1)]. Methylprednisolone: When oral aprepitant as a 3-day regimen (125-mg/80-mg/80-mg) was administered with intravenous methylprednisolone 125 mg on Day 1 and oral methylprednisolone 40 mg on Days 2 and 3, the AUC of methylprednisolone was increased by 1.34-fold on Day 1 and by 2.5-fold on Day 3 [see Drug Interactions (7.1)]. Docetaxel: In a pharmacokinetic study, oral aprepitant administered as a 3-day regimen (125-mg/80-mg/80-mg) did not influence the pharmacokinetics of docetaxel. Vinorelbine: In a pharmacokinetic study, oral aprepitant administered as a 3-day regimen (125-mg/80-mg/80-mg) did not influence the pharmacokinetics of vinorelbine to a clinically significant degree. Oral contraceptives: When oral aprepitant was administered as a 3-day regimen (125-mg/80-mg/80-mg) with ondansetron and dexamethasone, and coadministered with an oral contraceptive containing ethinyl estradiol and norethindrone, the trough concentrations of both ethinyl estradiol and norethindrone were reduced by as much as 64% for 3 weeks post-treatment [see Drug Interactions (7.1)]. Warfarin: A single 125-mg dose of oral aprepitant was administered on Day 1 and 80 mg/day on Days 2 and 3 to subjects who were stabilized on chronic warfarin therapy. Although there was no effect of oral aprepitant on the plasma AUC of R(+) or S(-) warfarin determined on Day 3, there was a 34% decrease in S(-) warfarin trough concentration accompanied by a 14% decrease in the prothrombin time (reported as International Normalized Ratio or INR) 5 days after completion of dosing with oral aprepitant [see Drug Interactions (7.1)]. Tolbutamide: Oral aprepitant, when given as 125 mg on Day 1 and 80 mg/day on Days 2 and 3, decreased the AUC of tolbutamide by 23% on Day 4, 28% on Day 8, and 15% on Day 15, when a single dose of tolbutamide 500 mg was administered prior to the administration of the 3-day regimen of oral aprepitant and on Days 4, 8, and 15. This effect was not considered clinically important. P-glycoprotein substrates: Aprepitant is unlikely to interact with drugs that are substrates for the P-glycoprotein transporter, as demonstrated by the lack of interaction of oral aprepitant with digoxin in a clinical drug interaction study. 5-HT3 antagonists: In clinical drug interaction studies, aprepitant did not have clinically important effects on the pharmacokinetics of ondansetron, granisetron, or hydrodolasetron (the active metabolite of dolasetron). Rifampin: When a single 375-mg dose of oral aprepitant was administered on Day 9 of a 14-day regimen of 600 mg/day of rifampin, a strong CYP3A4 inducer, the AUC of aprepitant decreased approximately 11-fold and the mean terminal half-life decreased approximately 3-fold [see Drug Interactions (7.2)]. Ketoconazole: When a single 125-mg dose of oral aprepitant was administered on Day 5 of a 10-day regimen of 400 mg/day of ketoconazole, a strong CYP3A4 inhibitor, the AUC of aprepitant increased approximately 5-fold and the mean terminal half-life of aprepitant increased approximately 3-fold [see Drug Interactions (7.2)]. Diltiazem: In a study in 10 patients with mild to moderate hypertension, administration of 100 mg of fosaprepitant as an intravenous infusion with 120 mg of diltiazem, a moderate CYP3A4 inhibitor administered three times daily, resulted in a 1.5-fold increase in the aprepitant AUC and a 1.4-fold increase in the diltiazem AUC. When fosaprepitant was administered with diltiazem, the mean maximum decrease in diastolic blood pressure was significantly greater than that observed with diltiazem alone [24.3 ± 10.2 mm Hg with fosaprepitant versus 15.6 ± 4.1 mm Hg without fosaprepitant]. The mean maximum decrease in systolic blood pressure was also greater after co-administration of diltiazem with fosaprepitant than administration of diltiazem alone [29.5 ± 7.9 mm Hg with fosaprepitant versus 23.8 ± 4.8 mm Hg without fosaprepitant]. Co-administration of fosaprepitant and diltiazem; however, did not result in any additional clinically significant changes in heart rate or PR interval, beyond those changes observed with diltiazem alone [see Drug Interactions (7.2)]. Paroxetine: Coadministration of once daily doses of oral aprepitant 170 mg, with paroxetine 20 mg once daily, resulted in a decrease in AUC by approximately 25% and Cmax by approximately 20% of both aprepitant and paroxetine. This effect was not considered clinically important. Carcinogenicity studies were conducted in Sprague-Dawley rats and in CD-1 mice for 2 years. In the rat carcinogenicity studies, animals were treated with oral doses ranging from 0.05 to 1000 mg/kg twice daily. The highest dose produced systemic exposures to aprepitant approximately equivalent to (female rats) or less than (male rats) the human exposure at the RHD of 150 mg. Treatment with aprepitant at doses of 5 to 1000 mg/kg twice daily caused an increase in the incidences of thyroid follicular cell adenomas and carcinomas in male rats. In female rats, it produced hepatocellular adenomas at 5 to 1000 mg/kg twice daily and hepatocellular carcinomas and thyroid follicular cell adenomas at 125 to 1000 mg/kg twice daily. In the mouse carcinogenicity studies, the animals were treated with oral doses ranging from 2.5 to 2000 mg/kg/day. The highest dose produced a systemic exposure approximately 2 times the human exposure at the RHD of 150 mg. Treatment with aprepitant produced skin fibrosarcomas at 125 and 500 mg/kg/day doses in male mice. Carcinogenicity studies were not conducted with fosaprepitant. Aprepitant and fosaprepitant were not genotoxic in the Ames test, the human lymphoblastoid cell (TK6) mutagenesis test, the rat hepatocyte DNA strand break test, the Chinese hamster ovary (CHO) cell chromosome aberration test and the mouse micronucleus test. Fosaprepitant, when administered intravenously, is rapidly converted to aprepitant. In the fertility studies conducted with fosaprepitant and aprepitant, the highest systemic exposures to aprepitant were obtained following oral administration of aprepitant. Oral aprepitant did not affect the fertility or general reproductive performance of male or female rats at doses up to the maximum feasible dose of 1000 mg/kg twice daily (providing exposure in male rats lower than the exposure at the RHD of 150 mg and exposure in female rats approximately equivalent to the human exposure). In a randomized, parallel, double-blind, active-controlled study, EMEND for injection 150 mg as a single intravenous infusion (N=1147) was compared to a 3-day oral EMEND regimen (N=1175) in patients receiving a HEC regimen that included cisplatin (≥70 mg/m2). All patients in both groups received dexamethasone and ondansetron (see Table 7). Patient demographics were similar between the two treatment groups. Of the total 2322 patients, 63% were men, 56% White, 26% Asian, 3% American Indian/Alaska Native, 2% Black, 13% Multi-Racial, and 33% Hispanic/Latino ethnicity. Patient ages ranged from 19 to 86 years of age, with a mean age of 56 years. Other concomitant chemotherapy agents commonly administered were fluorouracil (17%), gemcitabine (16%), paclitaxel (15%), and etoposide (12%). EMEND for injection placebo, EMEND capsules placebo and dexamethasone placebo (in the evenings on Days 3 and 4) were used to maintain blinding. Dexamethasone was administered 30 minutes prior to chemotherapy treatment on Day 1 and in the morning on Days 2 through 4. Dexamethasone was also administered in the evenings on Days 3 and 4. The 12 mg dose of dexamethasone on Day 1 and the 8 mg once daily dose on Day 2 reflects a dosage adjustment to account for a drug interaction with the EMEND for injection regimen [see Clinical Pharmacology (12.3)]. Ondansetron 32 mg intravenous was used in the clinical trials of EMEND. Although this dose was used in clinical trials, this is no longer the currently recommended dose. Refer to the ondansetron prescribing information for the current recommended dose. Dexamethasone was administered 30 minutes prior to chemotherapy treatment on Day 1 and in the morning on Days 2 through 4. The 12 mg dose of dexamethasone on Day 1 and the 8 mg once daily dose on Days 2 through 4 reflects a dosage adjustment to account for a drug interaction with the oral EMEND regimen [see Clinical Pharmacology (12.3)]. The efficacy of EMEND for injection was evaluated based on the primary and secondary endpoints listed in Table 8 and was shown to be non-inferior to that of the 3-day oral aprepitant regimen with regard to complete response in each of the evaluated phases. The pre-specified non-inferiority margin for complete response in the overall phase was 7%. The pre-specified non-inferiority margin for complete response in the delayed phase was 7.3%. The pre-specified non-inferiority margin for no vomiting in the overall phase was 8.2%. N: Number of patients included in the primary analysis of complete response. Difference and Confidence interval (CI) were calculated using the method proposed by Miettinen and Nurminen and adjusted for Gender. Complete Response = no vomiting and no use of rescue therapy. Overall = 0 to 120 hours post-initiation of cisplatin chemotherapy. Delayed phase = 25 to 120 hours post-initiation of cisplatin chemotherapy. In a randomized, parallel, double-blind, active comparator-controlled study, EMEND for injection 150 mg as a single intravenous infusion (N=502) in combination with ondansetron and dexamethasone (EMEND regimen) was compared with ondansetron and dexamethasone alone (standard therapy) (N=498) (see Table 9) in patients receiving a MEC regimen. Patient demographics were similar between the two treatment groups. Of the total 1,000 patients included in the efficacy analysis, 41% were men, 84% White, 4% Asian, 1% American Indian/Alaska Native, 2% Black, 10% Multi-Racial, and 19% Hispanic/Latino ethnicity. Patient ages ranged from 23 to 88 years of age, with a mean age of 60 years. The most commonly administered MEC chemotherapeutic agents were carboplatin (51%), oxaliplatin (24%), and cyclophosphamide (12%). EMEND for injection placebo and dexamethasone placebo (on Day 1) were used to maintain blinding. Dexamethasone was administered 30 minutes prior to chemotherapy treatment on Day 1. The 12 mg dose reflects a dosage adjustment to account for a drug interaction with the EMEND for injection regimen [see Clinical Pharmacology (12.3)]. The first ondansetron dose was administered 30 to 60 minutes prior to chemotherapy treatment on Day 1 and the second dose was administered 8 hours after first ondansetron dose. The primary endpoint was complete response (defined as no vomiting and no rescue therapy) in the delayed phase (25 to 120 hours) of chemotherapy-induced nausea and vomiting. The results by treatment group are shown in Table 10. N: Number of patients included in the intention to treat population. Delayed phase = 25 to 120 hours post-initiation of chemotherapy. NDC 0006-3941-32 1 vial per carton. Emend for injection vials must be refrigerated, store at 2°C-8°C (36°F-46°F). Advise patients that hypersensitivity reactions, including anaphylaxis and anaphylactic shock, have been reported in patients taking EMEND. Advise patients to seek immediate medical attention if they experience signs or symptoms of a hypersensitivity reaction, such as hives, rash and itching, skin peeling or sores, flushing, difficulty in breathing or swallowing, or dizziness, rapid or weak heartbeat or feeling faint [see Warnings and Precautions (5.2)]. Advise patients to seek medical attention if they experience new or worsening signs or symptoms of an infusion site reaction, such as erythema, edema, pain, necrosis, vasculitis, or thrombophlebitis at or near the infusion site [see Warnings and Precautions (5.3)]. Advise patients to discuss all medications they are taking, including other prescription, non-prescription medication or herbal products [see Contraindications (4), Warnings and Precautions (5.1)]. Warfarin: Instruct patients on chronic warfarin therapy to follow instructions from their healthcare provider regarding blood draws to monitor their INR during the 2-week period, particularly at 7 to 10 days, following initiation of EMEND with each chemotherapy cycle [see Warnings and Precautions (5.4)]. Hormonal Contraceptives: Advise patients that administration of EMEND may reduce the efficacy of hormonal contraceptives. Instruct patients to use effective alternative or back-up methods of contraception (such as condoms and spermicides) during treatment with EMEND and for 1 month following administration of EMEND [see Warnings and Precautions (5.5), Use in Specific Populations (8.3)]. Copyright © 2008-2018 Merck Sharp & Dohme Corp., a subsidiary of Merck & Co., Inc.
Read this Patient Information before you start receiving EMEND for Injection and each time you are scheduled to receive EMEND for Injection. There may be new information. This information does not take the place of talking with your healthcare provider about your medical condition or treatment. What is EMEND for Injection? EMEND for Injection is a prescription medicine used with other medicines that treat nausea and vomiting in adults to prevent nausea and vomiting caused by certain anti-cancer (chemotherapy) medicines. EMEND for Injection is not used to treat nausea and vomiting that you already have. It is not known if EMEND for Injection is safe and effective in children. Who should not receive EMEND for Injection? are allergic to fosaprepitant, aprepitant, or any of the ingredients in EMEND for Injection. See the end of this leaflet for a complete list of the ingredients in EMEND for Injection. What should I tell my healthcare provider before receiving EMEND for Injection? are pregnant or plan to become pregnant. It is not known if EMEND for Injection can harm your unborn baby. Women who use birth control medicines containing hormones to prevent pregnancy (birth control pills, skin patches, implants, and certain IUDs) should also use a backup method of birth control that does not contain hormones, such as condoms and spermicides, during treatment with EMEND for Injection and for 1 month after receiving EMEND for Injection. are breastfeeding or plan to breastfeed. It is not known if EMEND for Injection passes into your breast milk. Talk to your healthcare provider about the best way to feed your baby if you receive EMEND for Injection. EMEND for Injection may affect the way other medicines work, and other medicines may affect the way EMEND for Injection works, causing serious side effects. How will I receive EMEND for Injection? EMEND for Injection is given on Day 1. It will be given to you by intravenous (IV) infusion in your vein about 30 minutes before you start your chemotherapy treatment. If you take the blood thinner medicine warfarin sodium (COUMADIN®, JANTOVEN®), your healthcare provider may do blood tests after you receive EMEND for Injection to check your blood clotting. What are the possible side effects of EMEND for Injection? Serious allergic reactions. Allergic reactions can happen with EMEND for Injection and may be serious. Tell your doctor or nurse right away if you have hives, rash, itching, flushing or redness of your face or skin, trouble breathing or swallowing, dizziness, a rapid or weak heartbeat, or you feel faint during or soon after you receive EMEND for Injection, as you may need emergency medical care. Severe skin reactions, which may include rash, skin peeling, or sores, may occur. Infusion site reactions (ISR) at or near the infusion site have happened with EMEND for Injection. Most severe ISR have happened with a certain type of chemotherapy medicine that can burn or blister your skin (vesicant) with side effects, including pain, swelling and redness. Death of skin tissue (necrosis) has happened in some people getting this type of chemotherapy medicine. Most ISR can happen with the first, second, or third dose and some can last up to 2 weeks or longer. Tell your healthcare provider right away if you get any infusion site side effects. Tell your healthcare provider if you have any side effect that bothers you or that does not go away. These are not all of the possible side effects of EMEND for Injection. For more information ask your healthcare provider or pharmacist. If you would like more information about EMEND for Injection, talk with your healthcare provider. You can ask your healthcare provider or pharmacist for information about EMEND for Injection that is written for health professionals. For more information about EMEND for Injection call 1-800-622-4477 or go to www.emend.com. What are the ingredients in EMEND for Injection? The brands listed in the above sections "Who should not receive EMEND for Injection?" and "How will I receive EMEND for Injection?" are the registered trademarks of their respective owners and are not trademarks of Merck Sharp & Dohme Corp., a subsidiary of Merck & Co., Inc.
Each vial contains 188 mg of fosaprepitant dimeglumine equivalent to 115 mg of fosaprepitant for infusion when reconstituted with 5 mL saline and diluted according to package insert. DO NOT USE WITH SOLUTIONS CONTAINING DIVALENT CATIONS (e.g., Ca2+, Mg2+) INCLUDING LACTATED RINGER'S SOLUTION. and diluted according to package insert.